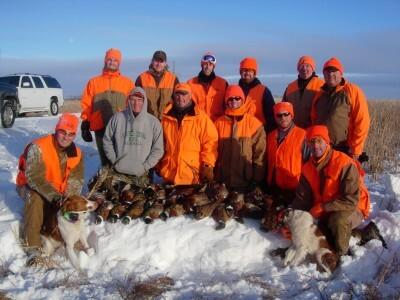 A South Dakota Small Game License For hunting and license information or to purchase your license online go to http://gfp.sd.gov/ You can also purchase licenses at most South Dakota sporting good stores, grocery stores and gas stations. Hunting dogs need to have up to date vaccinations. Alcohol is not allowed before or during the hunt. There is plenty of time after the hunt to celebrate the days accomplishments. A safe hunt is a great hunt! We want everyone to enjoy their South Dakota hunt so we’ve put together a few suggestions which will help make the most of your experience. Pheasant hunting requires a good deal of walking through all kinds of terrain, therefore, we encourage you to invest in a good pair of hunting boots. Make sure your boots are comfortable, warm and waterproof. Be prepared for all kinds of weather! Oct., Nov., and Dec. temps can range from 80 degrees to well below zero! Layering your hunting clothes allows you to adjust for temperature changes throughout the day. Most pheasant hunters, hunt with a 20 or 12 gauge shotgun. South Dakota law requires guns to be unloaded in the vehicles but not cased. Bring plenty of ammunition. Regular shot size with 1-1/4 oz. load with #4, #5 or #6 shot is enough power for our kind of hunting (3-inch shells are NOT needed).